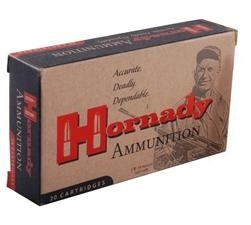 Hornady Custom-grade ammunition provides custom ammunition in a factory production loading. Built to the tightest tolerances for peak performance rivaling and sometimes surpassing hand-loads in many guns. The InterLock is designed to be a devastating hunting bullet and nothing less. The InterLock Ring - a Hornady exclusive - ensures that the core and jacket remain locked during expansion. The InterLock retains more mass, energy and momentum after impact and transfers that energy to the target. Its reliable stopping power has earned the InterLock a worldwide reputation as a bullet for serious hunters. This ammunition is new production, non-corrosive, in boxer primed, reloadable brass cases.